Twitter rolled out a new profile design this month, starting with a few select accounts in early April then rolling it out worldwide starting April 22, 2014. Naturally, there were very mixed exmotions. Many loved it, many hated it and many compared it to Facebook. If you recently updated to the new profile and hate it, unfortunately, there’s no way to change back your profile to the old version. There is, however, a workaround that you just may love if you’re looking for simplicity (and it’s FREE!). As an added bonus, this Twitter tool can help you maximize your tweet power for social media marketing through Twitter. 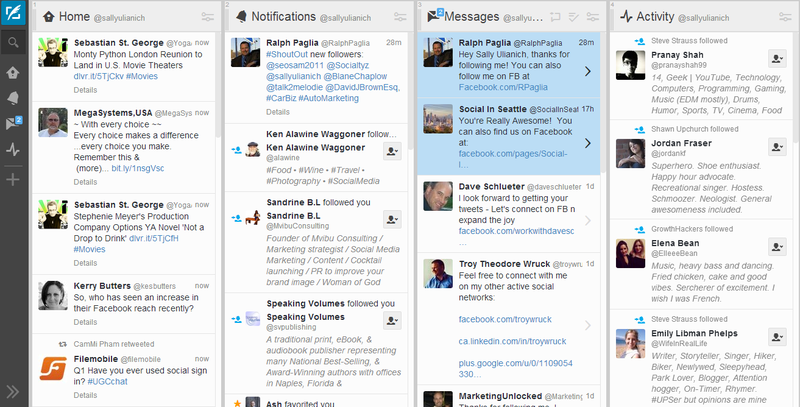 This amazing Twitter tool is TweetDeck. It’s a Twitter app that streams all your Twitter activity in one clean, organized interface. Signing up is easy, just use your Twitter account and it pulls all your Twitter activity in instantly. If you can handle all the Tweets, notifications & DM’s flying down the page, TweetDeck is an awesome way to view your Twitter account(s). Monitor multiple timelines in a single interface. Turn on emerging information alerts. Filter searches based on criteria such as engagement, users and content type. Build and export custom timelines to use on your website. Keyboard shortcuts for quick navigation. Ability to mute users or terms to eliminate unwanted noise. Real-time streaming – never hit refresh again. Ability to manage multiple accounts in one place. Choose a light or dark theme based on your preference.